If you suffer from severe range anxiety, may I recommend Andorra? This small principality, nestled in the Pyrenees between Spain and France, has such generous tax laws that booze, fags and, most obviously, fuel – at around €1, which is currently 85 pence, per litre – are extremely cheap. Which means filling stations are everywhere. “You should go to Andorra,” I was told when we were lining up the longest test yet of the new BMW 5 Series. Our mission was a drive of at least 2000 miles, from southernmost Spain to Britain in three days, with the second of those spent somewhere pretty for photographs. Andorra is extremely beautiful, apparently. But, 10 minutes in, entering the capital, Andorra la Vella, all I’ve seen is the exquisite beauty of two-dozen filling stations, populated partly by Andorrans but mostly by Spaniards, who have made the short trip across the border for fuel and/or drink and smokes. It’s easily the most flammable country I’ve ever been to, then, if not the most picturesque – at least not yet. But I’m confident it will be. I’ve seen the website and raised the alarm. If Andorra is famous for anything (outside of the north of Spain, where they know it for cheap intoxicant runs), it’s skiing. Basically its whole 180 square miles is ski runs, isn’t it? Or so I ask photographer Stan Papior while we’re spending an entire day spearing north through Spain on lightly trafficked motorways. It is. It’s a BMW G30 (new vehicle codename) 530d xDrive M Sport saloon B57 (engine codename) 3.0d, according to the official bumph. All of that means this should be a 3.0-litre diesel motorway bruiser and all-rounder of the highest order. Power is 261bhp, torque is 457lb ft, CO2 emissions are 138g/km and it costs £48,355 before options. This car has a few of those, which take the price on the spec sheet to more than £60,000, but we’ll come back to that. The important options, dynamically, are 20in wheels and adaptive control for the dampers. As usual, this all gets a bit complicated: if you choose an M Sport-spec car, you get lowered suspension, which you can now have with xDrive if you want (you didn’t used to be able to). However, you can delete the lowered suspension at no cost if you choose, so you get an M Sport on regular SE suspension. 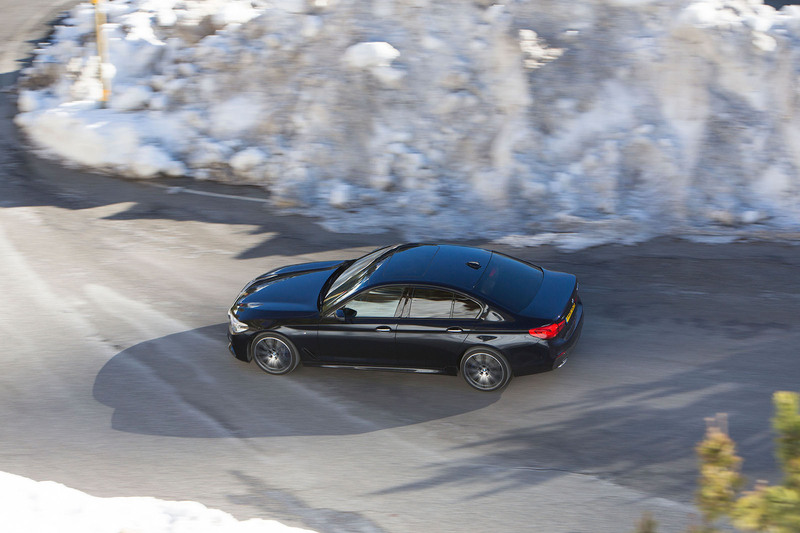 The 530d can be had with or without xDrive, and in two-wheel drive form it’s rear-driven. In short, there are a lot of choices, but what bothers me most is that this 5 Series is wearing Pirelli P Zero tyres. So I bypass the cheap cigs and buy some snow socks. Not that there is any snow, at least at the lower levels (where Andorra’s capital is), bar the odd icy bank where the stuff has been shovelled earlier in the winter. And it’s sunny; due to its elevated height above sea level, Andorra is snowy in winter and, the interweb tells me, cooler than you’d expect of southern France/northern Spain in summer. That climate is why people love it for skiing, cycling and biking or driving. In the sunshine, at above 10deg Cbut with snow visible on higher peaks, it feels like you could have both a summer and a winter holiday at the same time. If you do, a 5 Series is thus far proving to be a pretty tidy way to get there. 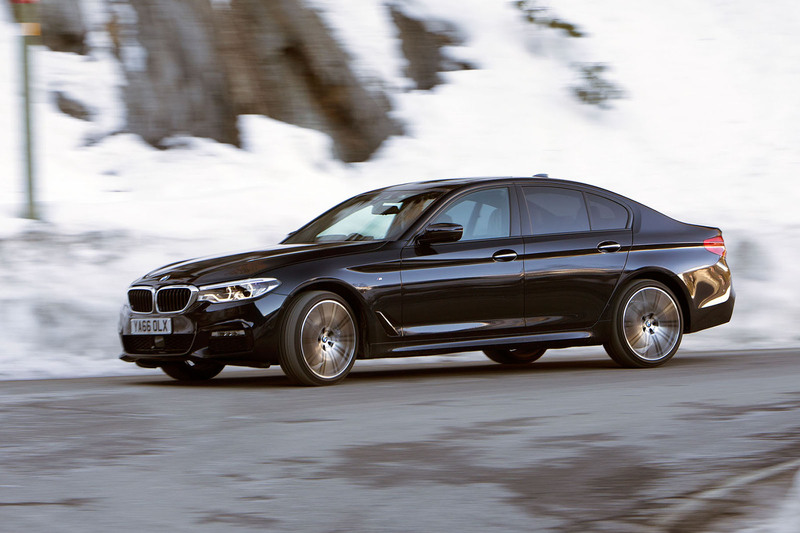 BMW throws everything at the 5 Series, its longest-serving model, now entering its seventh generation. It rides on the same platform, introduced last year, as the new 7 Series, but just because the 7 Series is bigger and more expensive, don’t think it’s the technology leader. Sure, the 5 Series does without the 7 Series’s composites within the structure, but much of the body is aluminium, part of an eminently sensible mixed-metal solution for a structure that’s claimed to be 100kg lighter than that of its predecessor, despite a marginal increase in dimensions (it’s still 1770kg in this spec, mind). And among the options lies some of the most advanced connectivity you could wish for. Still, it’s a big car, at 4936mm long and, like all of today’s executive cars, that makes it a potentially unwieldy beast. Over decades, executive cars have grown to what used to be luxury size, so a 3 Series, at about four and a half metres long, is where my own preferred blend of refinement and agility sits. But the additional space and isolation offered by the 5 Series isn’t to be sniffed at. Shoulder room is exceptionally broad, rear accommodation and the boot are large, and the 5 Series’s slightly descaled 7 Series platform is imperious on smooth Spanish motorways. Want to drive 730 miles in a day? We do, and the 530d engine’s extraordinary isolation and effortless oomph – and its easy 40mpg economy – make it one of the most appealing ways to do it. It’ll need to be, mind, because this is an extraordinarily tough class at the moment. Earlier this year I wrote a comparison of executive estates: a Mercedes-Benz E-Class, Volvo V90 and Audi A6, and rarely do we test cars that feel so evenly matched and so competitive at what they’re doing. There’ll be a rematch of some kind on these pages in the coming weeks, but no car in this class steamrollers the competition like once it might have. Each manufacturer’s resources are so great, and everybody has so much riding on it, that the best one company can do is seldom night and day from another’s. Even so, this 5 Series is some car. In isolation it’s easy to be impressed by it. It steers accurately and positively, with reassuring weight, the driving position is vast and comfortable, at speed the engine is inaudible and there is much to amuse you, and not just DJ Papior choosing a Cliff Richard song on Spotify. The connectivity and communications are first-class (although Google Maps still walks all over BMW’s own sat-nav, like it does everyone else’s), and the automony is… coming. Like its mixed-material architecture and its approach to diesel, petrol and electrification, BMW is sensibly open-minded about autonomous driving: it knows that if it covers everything, it has options in every market. So it figures that most of the time you’ll want to drive, but that sometimes you might want a hand with it, and eventually you’ll want the car to do its own thing. And you’ll want all of that from one car. 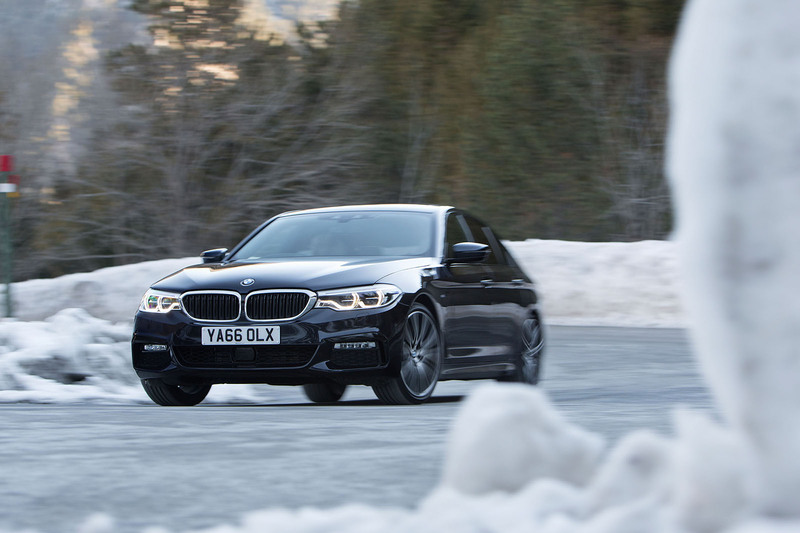 The new 5 Series, then, can steer itself in its lane and accelerate and brake itself. It’s not autonomous by any means – the steering has a halfmoment of hesitation when you pass a slip road on the motorway – but I do find it knocks back driver fatigue; you can keep your awareness but reduce the functions you’d usually have to carry out, even subconsciously. In the UK, where it’s crowded and lane discipline is disastrous , it’s less useful, but overseas on broad, quiet roads I’d tick the option box every time. What it means is that when I start eyeing up the roads as they push higher in Andorra, I’m fresher than I’d otherwise be and, this being a BMW, I can switch off all the driver aids. The roads here are kept clear, even up to ski resorts, which is just as well because, while most people are running winter tyres, certainly not everybody is. But they press on a bit – on the way up to the ski lifts, at least. They’re excited, presumably, because they’re slower on the way back down later. 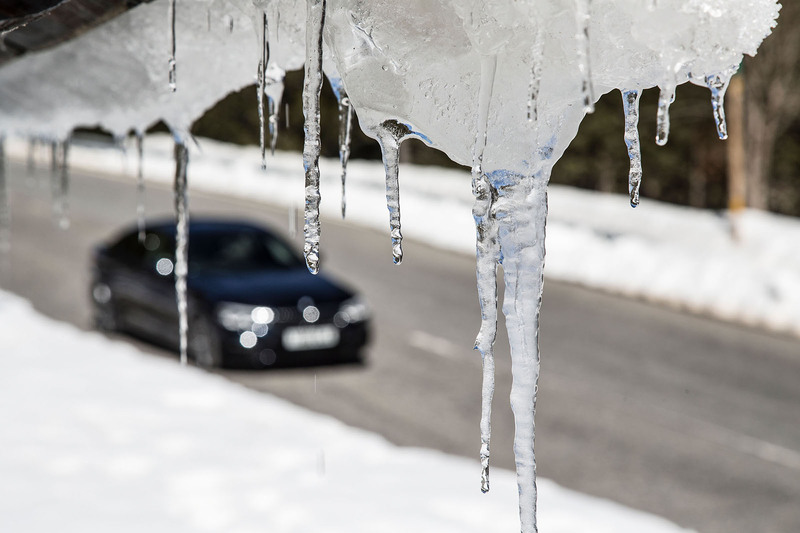 But these roads, at this time of year, while beautiful, are not built for enjoying on four wheels. We find better ones – quieter ones – lower down, on southern-facing slopes where, if there was any winter snowfall, it has departed with what feels like spring in the air, leaving only the altitude to ensure there’s skiing at higher levels. And here the 5 Series is good, enjoyable, with lots of traction, grip, poise and feedback. No car of this girth is going to be truly, magnificently, tremendously agile, although Jaguar’s XF has a crack at it. But don’t forget this is a multi-tasker; what it tries to do at this end of the scale has to be offset by what it does at the other end, where cars like the Mercedes E-Class excel. Certainly, I’m not convinced the 5 Series, at least on 20s, is as comfortable as an E-Class, and nor does it feel as lithe as an XF, but I don’t imagine BMW deliberately pitches it between the two. I rather suspect it thinks the 5 Series defines the segment and that other cars align themselves around it, rather than the other way around. But I think it’s the car that BMW will perceive has the broadest array of performance in the sector, intending it as comfortable as an E-Class, as dynamic as an XF, as pleasingly built inside as an A6 and as cool as a V90. I’ll leave it for someone else to decide where on the spider web chart of attributes the 5 Series ultimately sits. Meantime , I’m happy to steer it repeatedly around the same set of hairpin bends for Papior’s camera, soaking in the view and enjoying the poise of the car while knowing that, when the sun dips behind the Pyrenees and the lighting is just right, Stan will take his last photo and we’ll have another heck of a drive ahead of us. Pity. I could use another day in somewhere as pretty as this. Still, a third non-stop day at the wheel, another 800 miles. With that kind of drive ahead of you, you want a world -class car in which to do it, one that is comfortable, fast, economical, connected and willing to help you out. The new 5 Series, no question, is precisely that kind of car. Volkswagen does install Android Auto on some models, but I can understand why Porsche refuses and, personally, I'd never have a car with it fitted. Android Auto tracks many aspects of the vehicle's operation including vehicle speed, throttle position, fluid temperatures, and engine revs, information that is collated and then sent back to Google. It really raises questions about the amount of information sent back by vehicles that do use Android Auto, and what exactly Google is doing with that data. Mmm, I was completely unaware that Android Auto was collating vehicle information and sending it to Google. Do you have evidence of this ? A simple internet search will show many articles from reputable technology news sites regarding Android Auto. Headlines such as "Porsche chooses Apple CarPlay because Google reportedly asks for too much data". Google vehemently denies that it collects as much data as some reports say, but have we really ever been able to trust Google? Thanks, have now had a read at a number of articles relating to this issue. The video commentary says the 5 series they are driving has MSport suspension with adaptive dampers. That's not possible. Selecting either VDC or full adaptive drive will delete MSport springs and push the ride height back up to SE standard level.